A dazzling sun is the first thing I see. When I lift my hand to cover myself from the rays coming next surprise: my arm is made of steel and every point is a jumble of cables, screws and nuts. "The Talos principle" begins with the show that I'm a tool, not a human. I will spend the next 15 hours to prove the contrary. But let's start from the beginning: on an island in ancient Greece. Although the land mass is limited, it is crammed with ancient monuments. Marble statues and heaps of ruins scattered around as if someone had stowed down everything they knew about ancient Greece at a ridiculously small space. But of course, I don’t even think the ancient Greeks had neither force fields, laser beams, nor floating robot guards. Even weirder is how stable trees and solid walls sometimes flickers as if they were under attack by a kind of computer virus. Before we continue I would like to take another break. It may sound strange but right so here it feels to play "The Talos principle". The game allows namely two things: either it tells a captivating science fiction story, or it lets me solve excellent designed puzzles. "The Talos principle" does both things brilliantly - but rarely at the same time. Game mechanically reminds a little of "Portal". It is a clever puzzle game in first person perspective where I use different tools to solve puzzles and get hold of "Tetris" -like blocks, which unlock new environments or tools. My gear can be anything from jamming device to the laser senior crystals through machines that I can use to program a temporary clone. The labyrinth is a display of consummate puzzle architecture with solutions that are both creative and pleasing. 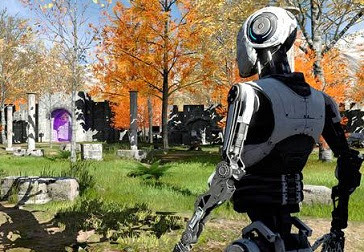 What makes "The Talos principle" one of the year's most cunning game is not just the ingenious puzzle design but also an existential detective story created by the mixture of Greek mythology and the future of fiction. Notwithstanding the ingenious labyrinth is the story that I find the game's greatest mysteries. From time to time, I hear a voice from the supposedly all-powerful being who calls himself the Elohim. He says he has created the world for me, and that I may explore the following abilities. But not the tower. Under no circumstances will I climb the tower. In the old computer terminals can I find the ancient emails fragments that contradict Elohim and additionally gossip about an impending doom. The more I explore the world, the more it resembles a virtual time capsule with fragments of lost civilizations. "The Talos principle" dare to ask philosophical questions about what constitutes a human being. Is it our bodies, our ability to use tools or is it our constant questioning of what makes us human? Although the world falls out from under my robot's feet, I continue to build my human capital, a "Tetris" block at a time. Firmly believe that it is my stubbornness and curiosity that makes me human. The enigmatic "The Talos principle", I have the benefit of both.